Cyberlove, fandom and Revenge of the Cybermen (1975) | Randomwhoness: a Doctor Who blog by Johnny Spandrell. Sampling stories in random order. When does one stop being a regular viewer of Doctor Who and become that oddest of things – a fan? I think it’s when you accumulate more knowledge about the series than would be available to a casual viewer. If you’ve invested time and energy into learning about a series, particularly if you’ve started to read the end credits, note the order of episodes, notice the continuity points between episodes, then I think you’ve crossed the fan threshold. For me, I think it was 1983. And specifically, the moment I bought that Radio Times 20th Anniversary Special. What a great publication that was, full of photos, interviews and behind the scenes details. Best of all – a complete list of serials, including those from the forthcoming 1984 series. And what news that list brought! Companions leaving and joining! Old monsters coming back! And biggest news of all – a new Doctor! Now, I had knowledge of the series’ future. I was now more than just an avid viewer. Now, I had entered the fan zone, never to return. 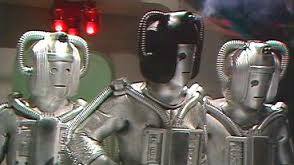 In 1983, if you’d asked me which was my favourite monster, I would have said straight away, Cybermen. No question. They had just made a barnstorming return to Doctor Who in Earthshock. They were the all time greats, I thought, and somehow I had absorbed enough fannish lore to know that Earthshock was a great improvement on the last Cyberman story, Revenge of the Cybermen (see, I knew we’d get round to it eventually). That one, I knew had been somewhat hokey and embarrassing. Not much chop at all. It was sometime later I realised that due to my age the only Cyberman story I could have actually seen was Revenge. And seen many times via the ABC repeats. It and only it could have been responsible for my Cyber admiration. It must have had something going for it. Watching it again gave me a few clues as to what. Mostly, it’s the stuff set on Nerva Beacon, not the stuff set on golden planetoid Voga. As the story goes, script editor Robert Holmes didn’t care much for writer Gerry Davis’s script, or for Cybermen in general. When someone found some extra money down the back of the filing cabinet, he expanded the story to include a subplot about the alien Vogans, old enemies of the Cybermen. The production team then secured a great location in some actual caves (Real caves! Not studio bound polystyrene ones, with dead level floors! How often does that happen?) in which to film the Vogan bits and that should have enlivened the whole affair. Except they really don’t. Voga is inhabited by two different types of rubber faced Vogans, some soldiery ones and some bureaucraticy ones. Their incessant squabbling eventually leads to them shooting at each other, using projectile weapons, the sound of which ricochets loudly and often through Revenge‘s soundtrack (punctuating another saxophone heavy score from Cary Blyton) Now I’ve watched Revenge many times, and once quite recently, and I still can’t remember what that lot are fighting about. Only that scenes of them fighting take up a lot of the story to little impact. By contrast, some of the Nerva Beacon scenes are eerily effective. The opening scenes, where the Doctor (rangy Tom Baker, vibrant and compelling in these early days of his tenure) and his mates Sarah and Harry (Elisabeth Sladen and Ian Marter, playing their roles with a rare smattering of sexual tension), come across a corridor full of dead bodies, is very creepy. The exhaustion of the crew, the sliminess of double agent Kellman (Jeremy Wilkin, giving a masterclass in snideness) and the threat of the venomous Cybermats… All this is effectively sold to the viewer by the actors and director Michael E. Briant, by creating an atmosphere of ongoing tension. Not bad considering they created this world despite the constraints of the budget and the studio. But studios are a Cyberman’s best friends. Take the big silver buggers on location and they are never as successful. Here on the beacon, they are imposing and daunting. Out in the murky caves of Voga, they don’t fill the screen with as much menace. And this is what other cyberstories like Tomb and Earthshock avoided, but think of them striding those green woodlands in Silver Nemesis or strolling through that Welsh quarry for The Five Doctors. Not as intimidating, not as threatening. These are creatures who are meant to stalk the corridors of bases under siege. Conversely, playing against this quiet menace is the Cyberleader himself (Christopher Robbie). Menacing he does a lot of, but he’s by no means silent. In fact, he’s very shouty from within that tin head of his. And he’s quite emotional for a member of a race which have done away with feelings. “In eight minutes,” he opines at one point, “the accursed Planet of Gold will be utterly destroyed”. He even displays a droll Cyber wit. “You are about to die in the biggest explosion ever witnessed in this solar system,” he tells the Doctor and Sarah in Part Four. “It will be a magnificent spectacle. Unhappily, you will be unable to appreciate it.” And he strides off, hands on his silvery hips. He’s long been singled out as one of the problems with Revenge. But I think he’s loads of fun, and I think I detect Robert Holmes’ hand in his characterisation. Holmes was skilled at creating enemies who would the audience would engage with, either hate or secretly root for. Where, I can imagine him thinking, is the fun in a villain who doesn’t have any emotional responses? Isn’t that the antithesis of drama? Give us someone to boo, and that’s what Robbie’s Cyberleader does. And good for him. And he’s American to boot. But back to 1983. The Radio Times special included a list of stories to date. Each story had a one to two sentence summary, written by uber fan Ian Levine. Every so often, one of the stories was highlighted as a ‘classic’. I can’t remember what it said about Revenge, but I doubt it was awarded that lofty distinction. I suppose that reading that list was the first time it occurred to me that some Doctor Who stories were better than others; prior to this the show had, in my uncritical mind at least, just been one consistently brilliant standard. And not only that there were some classic stories and some not so classic ones, but among people who knew such things, there was a shared acceptance about which ones were which. To fans, there was a hierarchy of Doctor Who. And now I was a fan, I’d be assessing them too. And since then, I’ve never really stopped. LINKS to The Deadly Assassin. The stories both spring from the same era, so have the same producer, script editor and, significantly, designer. Roger Murray-Leach designed a familiar circular celtic-looking symbol for the halls of Voga, which he reused to great effect in The Deadly Assassin, and has since become a kind of brand element for Gallifrey. So these are two stories linked by a logo. God knows if that’s going to happen again. SACRIFICIAL BLAM! Lesterson tampers with his Cyber buckle and bites the gold dust. NEXT TIME: We’re on the bloody moon to witness the meeting of Smith and Jones.